I wish all my readers a happy Easter full of the joy and hope that comes from the risen Lord. Should any of us have the slightest doubt, let us remember that there is no otherwise explicable way an image could be printed on the Turin Shroud. I leave you with a little definition given by the great Benedictine monk Dom Odo Casel of the Abbey of Maria Laach. The pasch is a sacrifice with the consecration of the person that flows from it; it is the sacrifice of the God-man in death on the cross, and his resurrection to glory: it is the Church’s sacrifice in communion with and by the power of the crucified God-man, and the wonderful joining to God, the divinization which is its effect. Both of these sacrifices flow together; they are fundamentally one; the Church, as the woman of the new paradise and the bride of Christ, acts and offers in his strength. Christ living in time made his sacrifice alone on the cross; Christ raised up by the Spirit makes the sacrifice together with his Church which he has purified with the blood from his own side, and thus won her for himself. Because of the inmost oneness of being, and the realm of action following upon it, which grows up between bride and bridegroom, between head and body, it follows that the Church must take a share in Christ’s sacrifice, in a feminine, receptive way, yet one which is no less active for that. She stands beneath the cross, sacrifices her bridegroom, and with him, herself. But she does so not merely in faith or in some mental act, but rather in a real and concrete fashion, in mystery; she fulfils the ‘likening’ of that sacrifice through which the Lord offered himself in the presence of earth and heaven, in utter openness, in the total giving of his body, to the Father. Here again we meet the essential meaning of the mystery of worship. Gothic restorations of the nineteenth century might have lacked complete academic authenticity, but Viollet le Duc was a major influence in the Gothic Revival like Pugin in England. Without his work, many great French churches would have crumbled and collapsed after the abuse meted out by the revolutionaries and the merciless weather. Again, a blessing in disguise, the fire of Notre-Dame de Paris has brought the patrimony of the Middle-Ages and the Gothic Revival into the foreground. Now is the time to appreciate our churches and cathedrals and remember why they were built – man’s homage to the glory of God. Viollet le Duc’s work is a part of this patrimony to treasure, restore and appreciate. In the Use of Sarum, we don’t use an altar of repose. The second two hosts of Maundy Thursday are simply put into the hanging pyx. On Good Friday, after the Liturgy of the Presanctified, the third host is put into the Easter Sepulchre as is the crucifix where they remain until the morning of Easter Sunday. The symbolism is somewhat different to the Roman rite that focuses on the prayer of Jesus at Gethsemane and a desacralised church on Good Friday to Holy Saturday. Sarum focuses on the intimate unity between the death of Christ and his Resurrection via this continued Presence. Easter Sepulchres in medieval churches are usually very ornate, and many remain from pre-Reformation days. I use a wooden board on the bishop’s throne (Bishop Damien Mead has sat on it once) and an urn I made some years ago, covered with a humeral veil. It was about the time when the fire alarm was given when I saw something on Facebook. News from mainstream sources was still rare, and only the roof over the crossing was ablaze. The fire brigade was there very quickly. Unfortunately, their equipment was not designed for the height of a cathedral and water dropped from an aircraft would have caused the building to collapse. Most of the roof was lost. Those men are true heroes, and they risked their lives. They finally extinguished the fire in spite of all the difficulties. There are two big holes in the vault and experts have been called upon to evaluate the stability of the cathedral without its roof. The purpose of flying buttresses is to compensate for the downward and outward pressure exerted by the roof. Modern technology will find the solution, especially as such calculations of compensating forces were current in the thirteenth century! This is a calamity for France, Europe and the entire world. Notre Dame represents more than a Christian place of worship, but is also a national cultural symbol. President Macron has pledged his support and generous financial aids. In France, all churches older than 1905 belong to the municipality and cathedrals belong to the State. An idea came into my mind this morning: a blessing in disguise. Let me explain. The cathedral was in very poor condition and restoration work had begun. The wooden spire over the crossing was surrounded by scaffolding and precious statues has been removed for restoration only a few days before. How did the fire start? An inquiry has begun, and the French authorities will without doubt find out and tell the media. 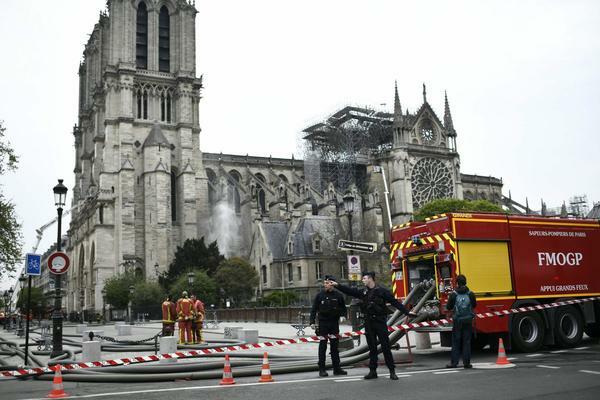 Over the past few months, churches in France have been victims of vandalism and arson, sometimes committed by fanatical individuals for religious or ideological motives. It would not seem to be the case here, since the public do not have access to the part of the cathedral where the fire started. The fire united people, religious and non-religious, in grief for this monument of national culture. The media was brought to reflect on Christianity at the roots of French and European culture. People were singing and praying in the street with their priests, who had the bells of their churches ring. What an amazing witness for their faith without any triumphalism. The cathedral will take decades to restore to its splendour, but the message has been put over this very day. Europe and France are Christian and invite us all to turn to Christ during this Holy Week, Easter and forever afterwards. Update: The main organ is safe and has not been damaged by either water or heat. We are still waiting to know that all the masonry is stable and not about to collapse. They have experts looking at it all. I have just found this daguerreotype of the cathedral before the restoration work of Viollet le Duc began in the 1840’s. There were no gargoyles. Viollet-le-Duc added them after having read too much Victor Hugo! In this photo, there is no flèche (spire). We wait with bated breath to know what will be decided for the restoration work. It has been nearly three weeks since I wrote anything. The smoggy air seems to have cleared a little as has my anxiety over the political situation in England. I probably understand things a lot better as I see the general tendency in Europe and the entire western world. It is tempting to make comparisons with historical examples, but they all fall, because our time is unique. Whatever happens now, we have to become self-reliant in our thought and our readiness to react. My guess is that the war of attrition will wear down the opposing factions, and that the can will be kicked down the road until it disappears. A part of my Lenten reading has been Alan Jacobs, The Year of Our Lord 1943: Christian Humanism in an Age of Crisis, Oxford 2018. A gentleman in the eighteenth century who found himself on the wrong side of the law mused that the prospect of being hanged in a fortnight focused the mind. Certainly for many people, living during the second world war did a lot for the instinct of survival, ingenuity, resourcefulness and a desire for more than peace: a forward-looking view to prepare mankind for peace via philosophy and education as well as Christian faith. Ironically, some of our right-wing “gammons” in England are nostalgic for that era, perhaps in some cases for the same reasons of being tired of man’s “foolish ways” and seeking a more elevated vision. I am still reading this fine book, and it has brought me to understand many things about people like Simone Weil, Jacques Maritain, C.S. Lewis, T. S. Eliot and W. H. Auden. Maritain had a lot of influence on Pope Paul VI, and so reading this French philosopher will answer many questions I have about the “changes” in the Church in the 1960’s. I have Maritain’s Humanisme Intégral in the bookshelf in front of me, waiting to be read. I have used some of my time of Lenten silence to begin writing a book with the simple and unpretentious title Romantic Christianity, organised into two main chapters respectively dealing with the Christian mystery, the esoteric tradition and the continuing historical role of the Romantic movement. Work is always slowed by translating orders as they arrive, including an entire prospectus on projects of remodelling rapids on rivers in French Guiana so that the entire length of the rivers can be navigable by pirogue boats with powerful outboard engines. These boats are almost the only means of transport into the Amazonian jungle both for passengers and freight. It was quite an education, since the job encouraged me to learn about those countries along the north-east of the South American continent via YouTube videos and articles. The old French penal colony of Saint Laurent du Maroni and the Iles du Salut (including Devil’s Island of Papillon and Dreyfus fame) is still present down there even though the establishment closed in 1953. I have just received another one from Peugeot-Citroën, but a little shorter than in previous months. I don’t find it easy to go from one task to another, but it is necessary. It’s my job. We now arrive at Holy Week, the centre of the Mystery of the Transitus Domini in all its biblical archetypes. There are many esoteric themes too from the Renaissance revival and the rediscovery of the Gnostic scriptures from Nag Hammadi. It is all challenging, but we do well to approach this mystery with simplicity and childlike humility. Each day brings its drama and turn of the tragedy as Christ faced human wickedness and the establishment religion of those days – post-Exile Judaism. As we live the emptiness of Good Friday evening, the first strains of the Alleluia begin to penetrate the stygian gloom. Elgar asked his orchestra to play the Pomp and Circumstance March in D as if the musicians had never heard it. It is a difficult thing to ask of those who have become cynical and jaded. Let us approach this Mystery as if it were for the first time! This is to replace an earlier posting which unintentionally caused offence and bad feelings among people I greatly esteem. The title is the German expression Pope Pius XI used to say “with burning concern” as he faced the situation in Europe in his time. It is appropriate to my own feelings, whilst I am at the same time a priest with a duty to avoid getting involved in politics to the extent I have allowed myself to do so. I have also pulled a couple of earlier posts. If anyone wants to find articles on Brexit, there are better sources than I on the Internet. I have been caught between the informed pro-Brexit opinions of those who are close to me, my concern for my country and for the rest of Europe. When the darkest days of World War II arrived, priests helped the victims to safety and did what they could without adding to the conflict and killing. We are not at war, but the future is utterly unpredictable, even day by day. According to my latest information, I don’t believe that no-deal Brexit can happen because there are laws preventing it. Maybe it will be May’s deal or the whole thing will be called off. Who knows? It is not up to me. I am not concerned about my personal situation, because I am a legal immigrant in France and my various approaches to the Administration have gone smoothly and according to the rules. My prayers and hopes go out to the millions of souls who have been disenfranchised in this national crisis, and who have manifested their desires without any violence or vandalism. I empathise with their anxiety and concerns. As I mentioned in the deleted posting, I have not made up my mind whether to bring this blog to a close or simply suspend it until the situation in the UK is brought to a close in one way or another. I am not the one to get involved in such matters because my autistic condition causes me to lack discernment and I “melt down”. I ask your prayers. If others with facilities for posting wish to contribute something, they are welcome. Comments are still welcome and I will read (and maybe respond to) them. It is essential for me to wind down and change course. When I lived in London, I rented a room at the East End Mission in Commercial Road. I could get to the London College of Furniture at the other end of that very long street in London’s East End on foot or a single short bus ride. When I was there, I met a young man with whom I shared two passions: the Christian faith and machines. Hugh, as he is called, fancied himself as an inventor. Among his ideas was a motorcycle that couldn’t fall over. I can’t remember the principle of its operation, though it was probably some kind of gyroscope to reinforce the stability a running two-wheel vehicle already has. Another was an infinitely variable gearbox without the use of drive belts. He spent hours explaining it to me, showing me crude drawings and calculations. As always, I noticed a lack of rigour in his work and the fact that he had not produced any accurate technical drawings or attempted to produce some kind of prototype to prove the theory through experiments. Then, he moved onto a perpetual motion machine, claiming that such had been successfully invented in the eighteenth century. This is the legend of the Orffyreus Wheel. The inventor of this device was an odd character, probably a fraud. Whatever, his “invention” died with him. My friend Hugh, who persuaded me to convert to Roman Catholicism from about 1980, thought he could retro-engineer the secret machine in its round wooden box. I am myself fascinated by machines, but I have a more realistic notion of them based on the laws of physics I learned at school, especially those of Isaac Newton. Namely, energy can neither be created nor destroyed. Quantum mechanics show a new slant on these questions, but Newton is nearer the mark with machines of human invention. A machine can be incredibly efficient by reducing the friction, for example in its bearings, but the energy put into it from fuel or other external power source is dissipated into heat by friction. If you reduce the friction, and run the machine in a vacuum, it will continue to run for much longer under its inertia (think of a flywheel), but it will eventually exhaust its energy and come to a stop. Foucault’s Pendulum is probably the nearest thing we have to perpetual motion, but it too will stop as energy is dissipated as heat by friction. The device in the illustration above is no more than a very efficient flywheel. It will work and the effect of the weights will prolong the inertia of the wheel, but the energy will still be dissipated at the main bearing and atmospheric air friction. Hugh has often telephoned me about his belief of having solved the mystery, but each time, I asked him about his working drawings, engineering calculations and whether he has successfully built a prototype of the machine. All these possibilities were impeded by his lack of finance. I had to explain that though I am fascinated by machines, I am not an engineer or a physicist, and cannot be of any help. He would have to do his own work and bring it to a conclusion or move on to other things in life. Sometimes, we have to be humble (truthful) and know our limits. 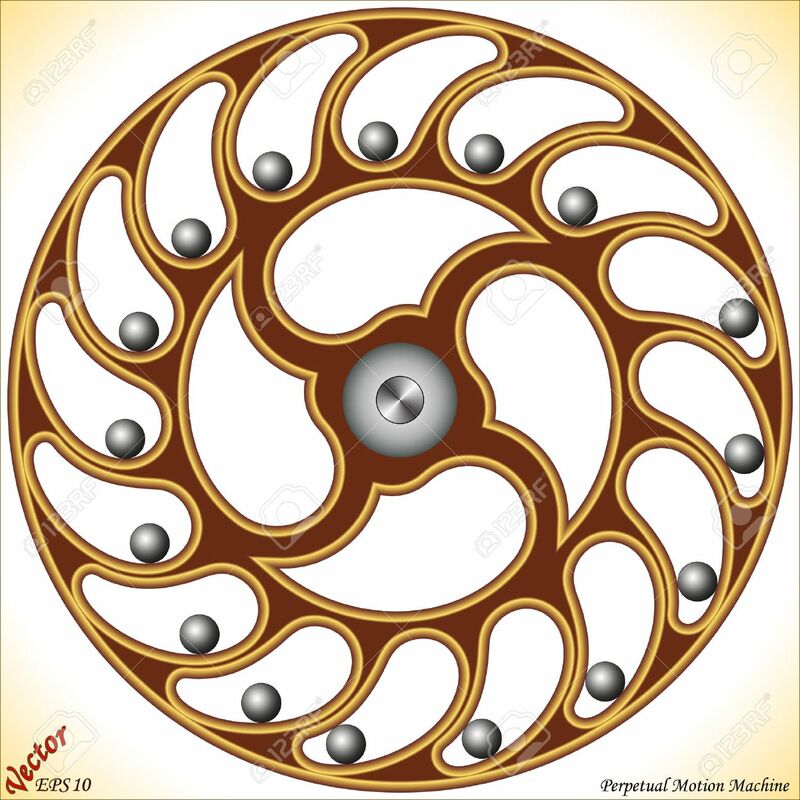 Hugh sent me a fascinating book about the Orffyreus wheel and other weird ideas and phenomena, but I was never satisfied with an explanation of why an idea could ever become a working machine doing what it was claimed to do. Perpetual motion is impossible, but there are devices that are incredibly efficient in terms of energy conservation. This is where an inventor can truly excel. Why this subject? I hit me on the head as I read the blog article This is what a politics based on lies looks like. Its author, like Hugh, attempted to build a perpetual motion machine. He was confronted by the impossibility of such a device, and the explanation of his father who was a mechanic in the army. We now move out of the world of physics and mechanics into the notion of truth. Whilst researching Romanticism and German Idealism, I have had to consider different notions of reality and truth between the physical and the metaphysical. To understand something of the complexity of epistemology (theory of knowledge and truth) we can try to read Foundationalism. In our experience of life, truth seems to be self-evident, but there are quirks and inconsistencies that our traditional logical reasoning cannot solve. I have experienced the paradox, the clash of two or more truths that seem to be self-evident to the believer. According to anti-foundationalism, truth is not something we can possess, but something beyond our own experience towards which we aspire by Sehnsucht. You might care to read this pdf article on some of the ideas of Hölderlin and Novalis from the Jena school, which you might find as tiresome as the perpetual motion machine! The foundation is the basis on which we believe an idea or phenomenon to be self-evident. This is also the impression I have had of the political situation in the UK. Brexit is based on a contradiction between hard Brexit and the Good Friday agreement that brought peace to Ireland. The backstop is a proposed solution, but the whole thing is based on lies, smoke and mirrors. There is not even an aspiration to truth. Brexit is like the perpetual motion machine. It is impossible without the UK giving Northern Ireland to Ireland or invading and occupying Ireland, something the EU will not allow. It would be an act of war by the UK, like Germany invading Poland, France and other countries in the late 1930’s and 1940. One thing that will help us with the conundrum of Brexit will be Aristotle’s Principle of Non-Contradiction. This principle is not universally applicable, but will do nicely in this situation of earthly life and Britain’s political shenanigans.